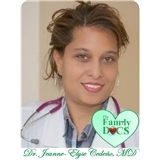 Jeanne-Elyse Cedeno, MD PA (Pembroke Pines) - Book Appointment Online! Hello. Hola. Bonjour. Welcome to the Family Docs where we provide Quality Primary Care for all ages: Children, Teens, Adults and Seniors. It is my desire to help you, your family, and our community achieve and maintain the best possible health with careful attention and individualized care. Services provided include routine primary care, sick care,physicals (including annual, school, employment, sports physicals), weight loss plans and programs, immunizations, screenings, gyn, accident and injury rehabilitation with onsite massage and therapy and labs drawn right here as well. I speak English, Spanish and French. I am here by the grace of GOD for HIS purpose. We look forward to assisting you with your health related concerns and goals. PLEASE NOTE: All New Patients MUST do bloodwork for first initial visit between 8:15am-11:30am (MUST be fasting.) NO walk-ins/New Patients after 11:30. I love Dr. Cedeno! She's amazing and she really cares about all patients! !